I don’t know about you, but I have quite a few boys around my house who have a real urge to build stuff. 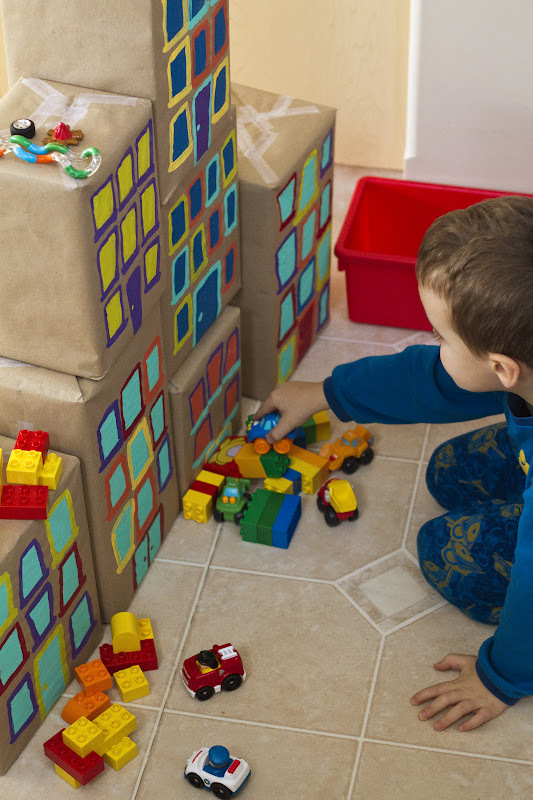 I think I own more different types of blocks than is necessary…but the boys think differently! They use the duplo blocks, the wooden blocks, foam blocks, mega blocks, bristle blocks, and the lego blocks and they will build for hours. Constructing big, elaborate buildings and ramps, bus lines, subways, houses, and roads. But what I noticed their cities didn’t have, was “bigger than life” skyscrapers! 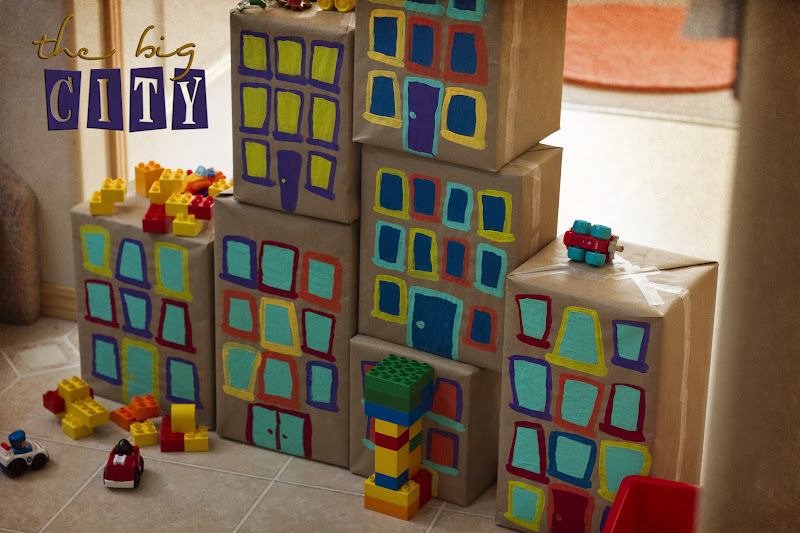 I have seen big fancy city building blocks made by Pottery Barn Kids, and I have seen a few versions floating around on Pinterest. I figured, “I could SO make those”…and make them out of materials I already had in my house. And so I did. And they are fabulous. And YOU can make them too. And you should. Your kids will love you for it. Even the babies like to play and stack these big buildings. Although, they mostly play the part of King Kong or Godzilla when the boys finish building up their cities! Hehehehe. Start by collecting all your “family size” boxes of things. I used Cheerios, Goldfish, and Cinnamon Toast Crunch boxes, because we go thru one each of those in a week, easy. It didn’t take me long to get enough boxes for a good sized city. 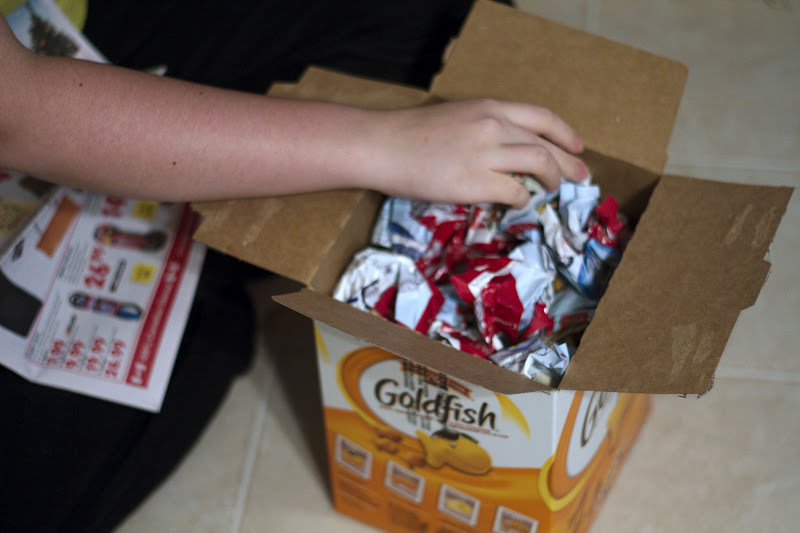 Fill your boxes with smunched-up newspaper to give the boxes a bit of weight. This will make them sturdier. 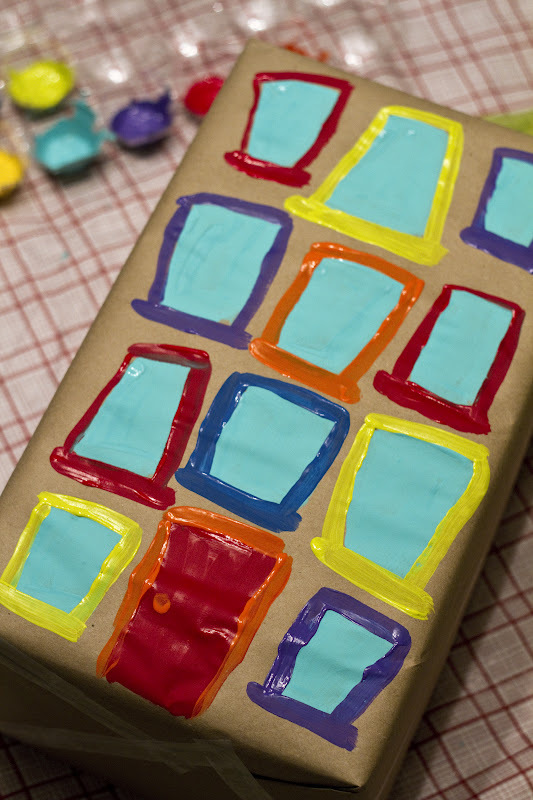 Tape the boxes closed, and then wrap with your choice of colored paper. I used brown paper because I figured it would wear the best. Smudges and dirt would show up too much on a white building! I found the rolls of heavy brown paper in the packaging aisle of Wal-Mart. You know the one that keeps the bubble wrap and packing tape and stuff? 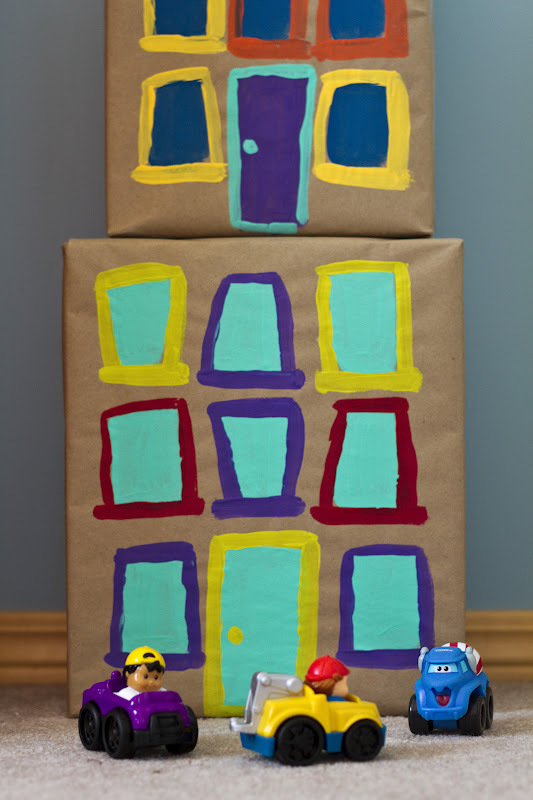 Once your boxes are all stuffed and wrapped, you can paint all your windows and doors on. I have seen versions with coloured card stock windows and doors, but personally, I did not want to cut and paste a gazillion squares and rectangles. I am intrinsically a girl who likes to get from A to Z quickly. Paint just seemed quicker and just as cute! And don’t worry about being precise. I gave the windows all a bit of a tilt to create a whimsical look…whimsical is not exact. Whimsical is your friend. Trust me. 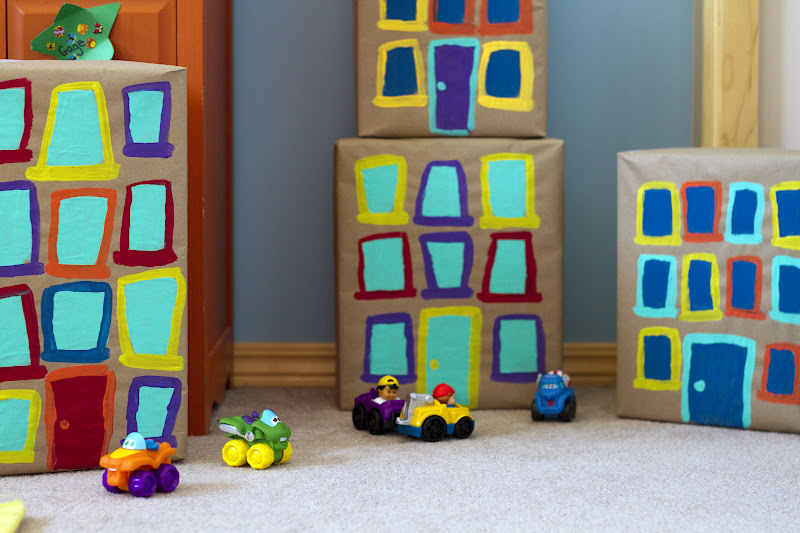 Let your building boxes dry overnight, and if you want, you can paint the other side so they are double-sided. This part is up to you. My kids were so eager to play with them, that I have not yet got around to painting the back side. Add little cars and people that you might already have at home. Remember this is supposed to be an inexpensive project! 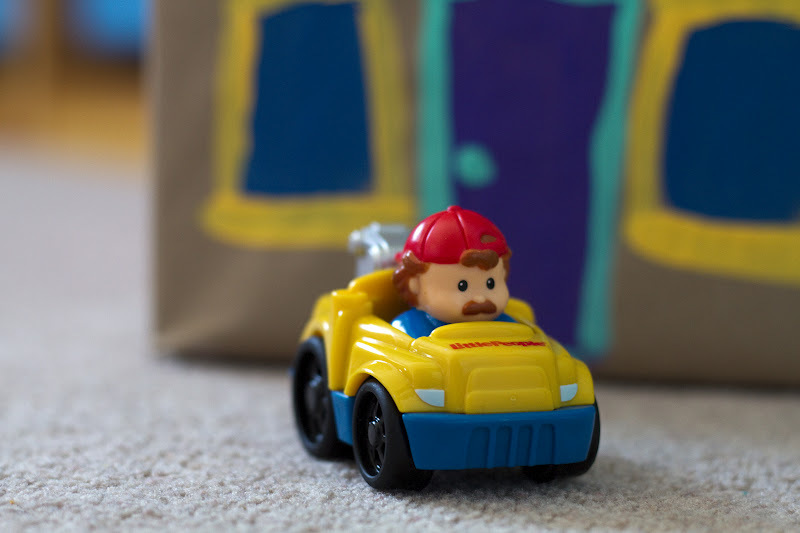 Even Hot Wheels will do the trick. The kids just want something with wheels to race around their cities with! And pretty soon, the other types of blocks, and props will start to find their way into the city. That’s when the fun starts. I love, love, love watching the kids absorbed in the world of city building…it makes me smile. Now, get going!! Go build some buildings! What an awesome idea! Just wanted to say hi and tell you what a great blog you have. I told a few young moms about it on the weekend.